Since then I’ve upgraded both my digital SLR and my film scanner, so it seems like it’s time to perform the comparison again. In 2006 I was shooting with a 6 megapixel DSLR (Pentax *ist-D), these days I’m shooting with a 10 megapixel K10D. Back then I scanned medium format film at 3200 dpi with and Epson 3200, these days I scan at 6400 dpi with an Epson V500. To facilitate this comparison, I shot the same scene with both a digital SLR and medium format camera, and then processed the respective images. The digital capture was taken with a ten megapixel Pentax K10d with a 16-45mm SMC-ED DA zoom lens. Both shots were taken at f16. The camera ISO was 400. There is a slight difference in the angle of view and framing between the two shots, which is the result of setting up to separate tripods and not lining things up perfectly. 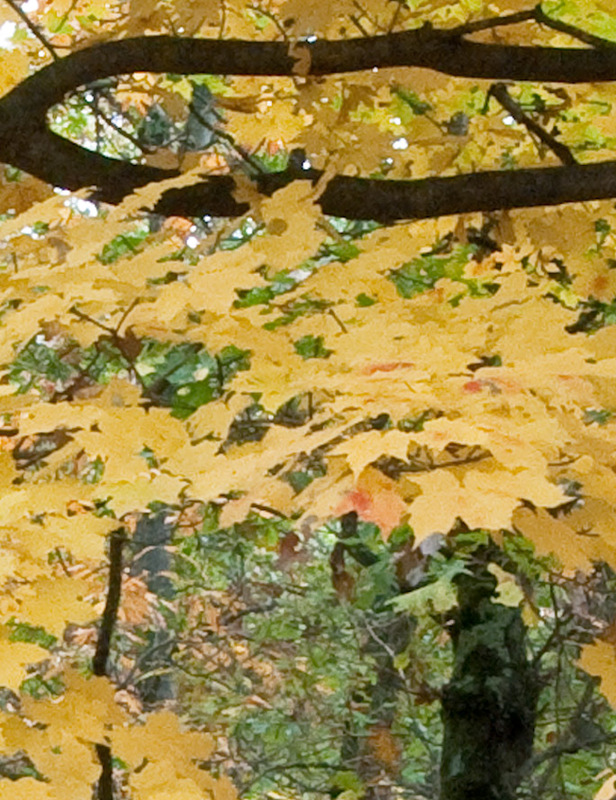 The images were taken last fall – I’m just now getting around to looking at this. This illustration shows the relative size of a 6400 dpi medium format scan, compared to a 10 megapixel digital capture (the smaller inset box) and the same digital capture opened to 25.3 megapixels in Adobe Camera Raw. Yes – these is a very substantial difference in size! The film scan is roughly 17,500 x 13,700 pixels in size – just under 240 megapixels in total. At 300 dpi, the full sized film scan would print at 58 x 45 inches. By comparison, the larger of the digital captures – which, of course, has been up-sampled in Adobe Camera Raw – is 6,114 x 4,113 pixels. That’s just over 25 megapixels and at 300 dpi would print at 20 x 14 inches. So without a doubt, the medium format scans are larger. But how much more information is in that larger image? After all, digital gets a real boost due to its superior ability to produce sharp edges (acutance) and much lower noise / grain levels. Comparing detail, and showing it on the web, poses a bit of a challenge. I decided to take two approaches. In one case I up-sampled the digital image to make it equivalent to the film scan. This is a bit unfair to the digital image, since it pushes it to sizes never intended for it. In the other case I down-sampled the medium format scan to make it the same size as the digital capture. This is a bit unfair to the film scan, since it basically discards and ignores one of it’s main advantages – the huge image size that it supports. Here are the two comparisons. In this case, I up-sampled the digital image to be the same size as the film scan. 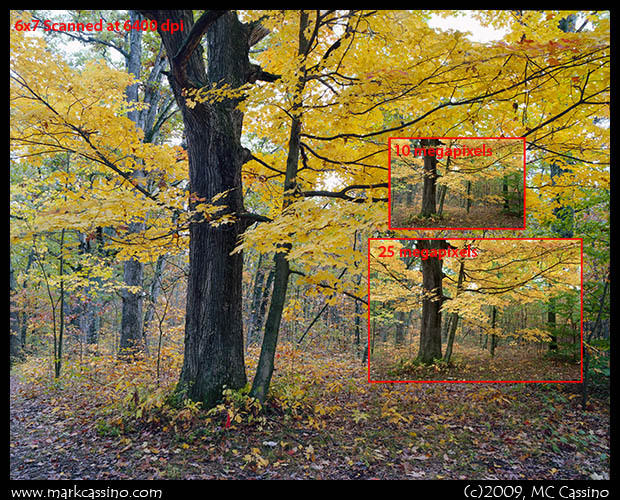 To do this, I first opened the image at the 25.3 megapixel size in Adobe Camera Raw version 5.3. 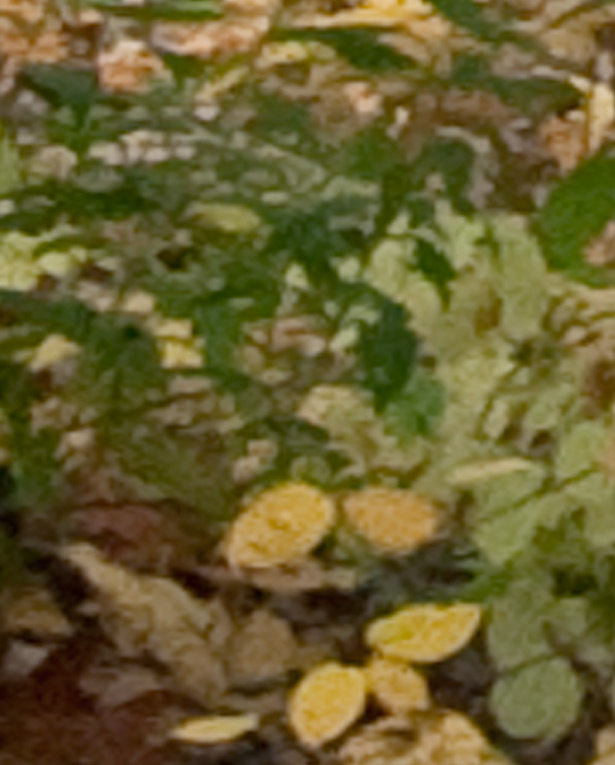 I then up-sampled the image in Photoshop, using the Bicubic smoother option. What can we conclude form this? Clearly, the medium format scans hold a lot more detail. In fact, disregarding comparisons, there is simply an impressive amount of detail in the medium format film scan. There’s no doubt that if you want to print large, going with medium format is a much better choice. The differences here are less pronounced. 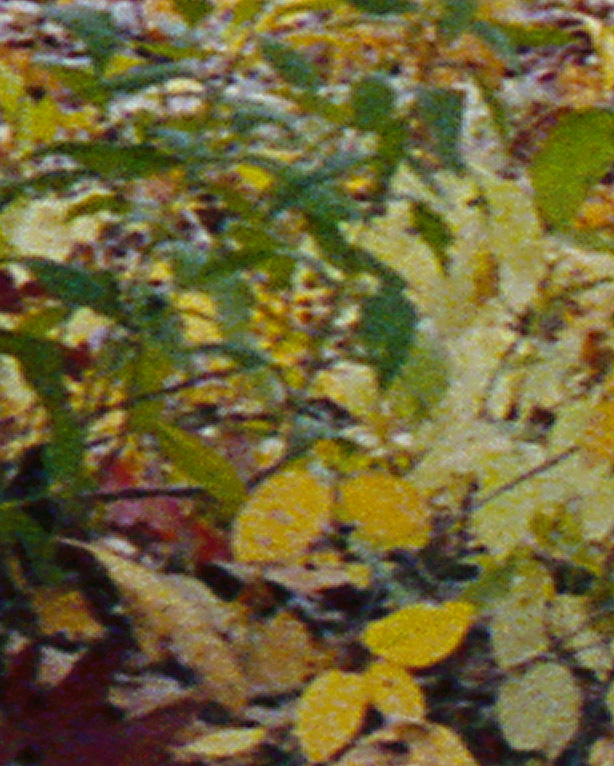 There is clearly superior detail in the film scan, especially in the brambly branches and twigs towards the middle bottom of the frame, but the difference is not as marked. 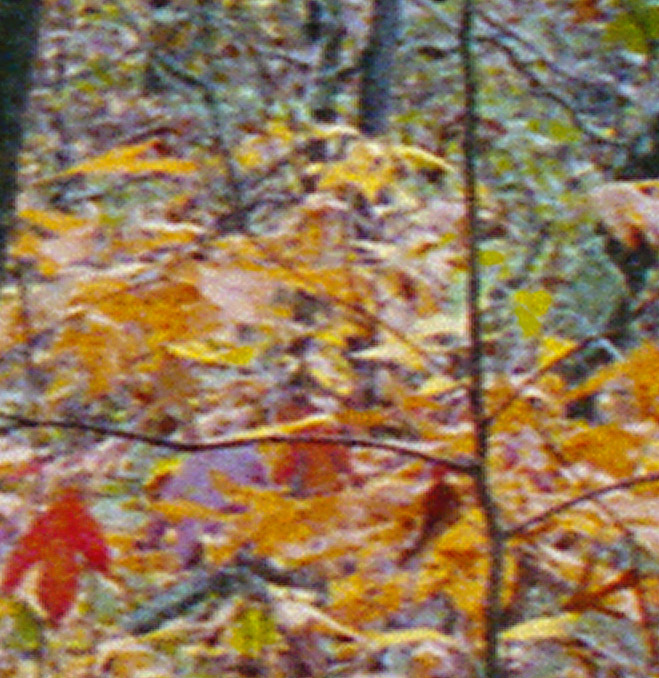 A bit of noise from the grain is evident in the film sample. 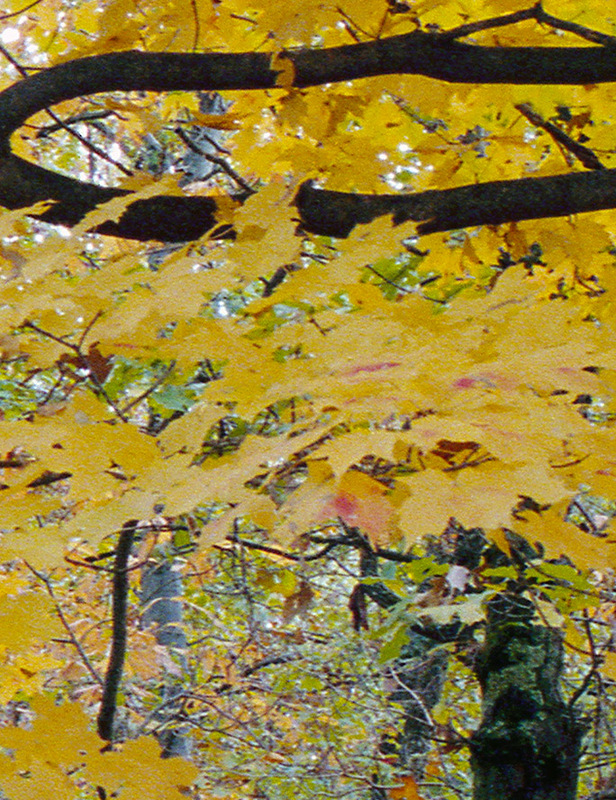 To my eye, the leaves in the film capture have a much more realistic look to them, due to the better level of detail. But I’m not sure that much difference would be apparent in a print. I think the images speak for themselves, and you can draw your own conclusions. One thing that I cannot demonstrate on the computer screen is the advantage that medium format gains by being able to print at a higher resolution. I’ve made a few 16 x 22 inch prints of this image from the medium format scan. The native scan is so large I print it at 720 dpi, and even then need to down-sample the image by 15% to get it to fit. The 720 dpi print really captures the great detail in this shot, and makes for a ver high quality print. As I’ve noted in earlier essays - like Stuff Per Pixel and Film Vs. Digital Photography – digital has a long way to go before it can achieve the level of resolution and detail that film offers. As I’ve also noted before, a lot of subjects do not have a high level of visual detail in them. For things like close-ups, architectural shots, portraits, etc., the advantages of digital probably outweigh the superior detail and resolution that medium format can deliver. But when detail is important, medium format really shines. Digital conitnually advances, and in time I’m sure someday I’ll give up on film. 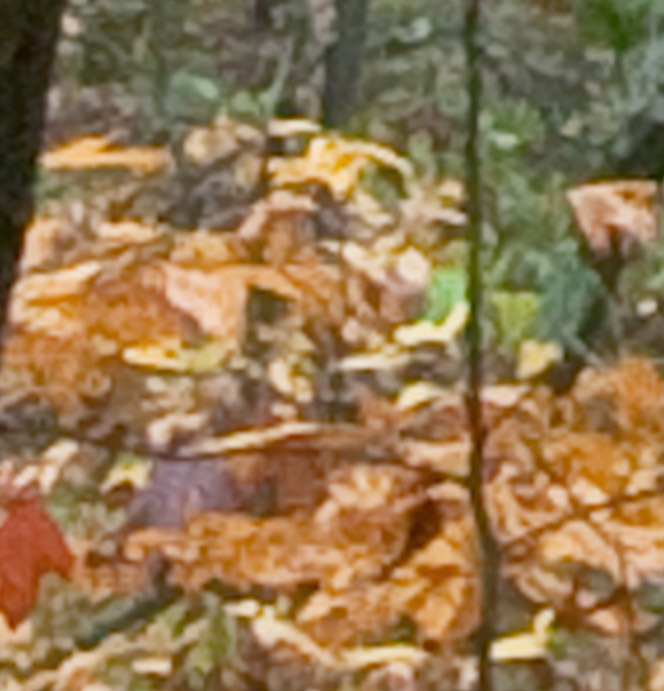 But for now, medium format film, even when scanned on a modest scanner, still outperforms digital for detail-rich shots of scrubby, brushy, woods.